Infinity edge pools are a growing trend. There are a lot of people who are asking for it, due to its stunning design. Infinity pools give the illusion that your pool extends into the horizon. The infinity edge designed pools are quite common in the resorts and prestigious hotels. They are also quite famous near the ocean and can create a seamless connection with the sea. People prefer to build an Infinity edge pools because of the attractiveness it provides. They also turn your backyard pool into a resort-like destination. The Infinity edge pool is quite similar to regular pools apart from one thing, it’s one or two sides do not have an end. Although the Infinity edge pool can be created anywhere, we think it will work best if your pool has a natural outward looking view. A backyard with an incline is a perfect place to install an infinity edge pool. The slope is necessary to provide the deep view of the pool. However, if your yard does not have a slope, don’t worry, with effective planning it can be installed in as well. So why build an infinity pool? Well, we’ve got you covered. Find out why so many people are going with a trendy infinity pool below. One of the biggest reasons to go for the infinity edge pools is that it adds an elegant and stunning appearance to your backyard. There are a lot of designs and variations that can be selected for the creation of infinity edge pools. The shapes and sizes can differ. Also, the material used can also be different. 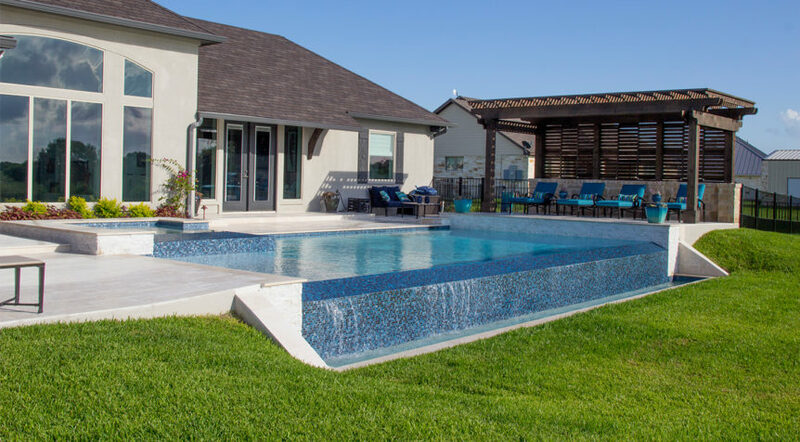 Custom pool builds also consider important points such as exact space present for the creation of the pool and the age of people who will be using it. Infinity edge pools have the ability to blend with the style of your house or interior. You can include it without ever worrying about the matching. Installing an infinity edge pool will provide a new and a unique look to your house. Platinum Pools can custom build a wide variety of infinity edge pools.